Fiscal year 2010 Medicaid spending by the fifty states, excluding administrative costs, exceeded $389 billion dollars. New York State led the states in total spending at $52 billion dollars. Medicaid costs are now the largest driver of state and local spending in New York State. Recent changes in State law have helped reduce the local costs, but Medicaid continues to dominate State and local expenses. Congress in 1965 established Medicaid under Title XIX of the Social Security Act to provide health insurance for the nation’s indigent population. It is an entitlement program, meaning that anyone who meets statutory eligibility requirements is entitled to Medicaid benefits. Over the years Congress has expanded Medicaid eligibility to include working families, primary care, family planning services, hospital services, home health care and related transportation services. Medicaid filled the void for millions of Americans who did not have access to private health insurance, but did so at great cost to state and local budgets. Medicaid, although a federal entitlement program, requires states to pay for a significant portion of the costs. The federal share is referred to as the federal medical assistance percentage while the state portion is the non-federal share. The size of the federal share for each state depends on a formula based on that state’s per capita income relative to the nation’s income. A state with a lower per capita income will receive a higher federal share. The minimum federal share is 50 percent of a state’s Medicaid costs. For fiscal year 2012, New York was one of a handful of states that received only the statutory 50 percent minimum federal share, while Mississippi, a less wealthy state, received the highest federal share at 74 percent. Medicaid became effective in New York in 1966. With no cap on federal dollars, Medicaid incentivized states to expand Medicaid coverage to federally allowable limits. Governor Nelson Rockefeller in 1966 took full advantage of the available federal dollars by expanding Medicaid coverage, but shifted half of the state’s share to local governments. Federal guidelines have few limitations on how the non-federal share is paid other than limiting the share paid by local government to no more than 60 percent of the non-federal share. 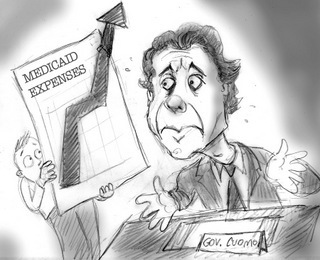 New York State leaders initially viewed Medicaid as an economic boon. The bulk of Medicaid costs would be paid for with federal and local dollars, not State dollars. Growth in Medicaid expenditures, however, quickly exceeded original expectations. In its first year, New York State expended $460 million on Medicaid. By 1968, with 2.6 million New Yorkers having Medicaid coverage, the program cost over $1 billion. Of the 2.6 million people covered, 1.7 million resided in New York City. In 1968 City expenditures reached close to $700 million. In 1971 New York City crossed the $1 billion expenditure threshold. By 2012, over 5 million New Yorkers, received their health coverage through Medicaid. Of those, close to 3.2 million recipients resided in New York City. Counties across New York paid more than $7.1 billion to cover Medicaid costs in fiscal year 2012, or 13 percent of New York State’s $53 billion total Medicaid expenditures. In fiscal year 2014 New York City anticipates spending $6.3 billion in City tax dollars for Medicaid. For the State, total Medicaid spending in fiscal year 2014 is projected to total $57 billion. Although the New York State Department of Health has primary responsibility over Medicaid, the program is administered at the local level by counties. One of the largest administrative roles played by counties is determining program eligibility. Eligibility tasks include eligibility screening, ongoing maintenance, and annual recertification of existing Medicaid recipients. As Medicaid expanded, these tasks have been spread over additional eligible populations. There are ten Medicaid programs administered by counties. These programs include Community Medicaid for Adults and Children, Family Health Plus, Refugee Medical Assistance, Medicaid Long-Term Care, Medicare Savings Program, and the Family Planning Benefits Program. Administering Medicaid programs accounted for expenditures of $464 million in New York City for fiscal year 2008 and employed 2,441 full time employees. For the other 57 counties across New York, administrative costs totaled $325 million. Administrative expenditures in 2008 only continue the existing trend, in 2003, for every county, Medicaid was the largest budget item, costing counties 73 percent of the property taxes collected that year. The fiscal burden New York State places on local governments is unique. Twenty-two states do not require local funding of the Medicaid program. Twenty-seven states require local contribution, but only for administrative costs, a small portion of certain services or other limited costs. In California, a state that is second in total Medicaid spending, counties contributed only $1billion in fiscal year 2009. New York, in fiscal year 2008, required counties to contribute over $6.6 billion to the State’s non-federal share. The disparity in county payments trickles down to the individual taxpayer. A taxpayer with a higher income living in a low-wealth county pays more towards Medicaid through local taxes than a taxpayer with an equivalent income living in a wealthier county. This disparity is unusual when considering that individuals do not pay taxes based on the number of prisoners or students that come from their county. The difference in local share payments means taxpayers with equivalent incomes, but reside in different counties pay very different amounts towards Medicaid costs. The state/local issue came to a head with the enactment of the Family Health Plus program, a federally approved state expansion, in 1999. Family Health Plus expanded coverage to include low-income adults between the ages of 19 and 64 who lacked health coverage, but earned more income than Medicaid allowed. Childless adults with incomes up to 100 percent of the federal poverty level were also included in Family Health Plus coverage. By September 2006, statewide enrollment in Family Health Plus was more than 500,000. With the enactment of Family Health Plus the State adjusted the Medicaid local share provision by requiring counties to pay for 50 percent of the Family Health Plus costs not paid for by the federal government. For fiscal year 2004, State and local spending for Family Health Plus reached close to $600 million – in addition to regular Medicaid costs. In 2004, the State legislature, responding to increasing local pressure, passed legislation requiring the State to take over 100 percent of the counties’ share of the Family Health Plus program. This was phased in between January 2005 and January 2006, and helped alleviate some fiscal pressure, but it did not quell the counties desire to have the State legislature cap local contributions. Governor George Pataki responded with a proposal capping the local share in his 2005-2006 executive budget. The Medicaid cap became effective in 2006 and set each county’s maximum responsibility towards Medicaid costs. A county’s maximum is calculated by taking the amount expended on Medicaid by the county in calendar year 2005 and then increasing that figure by the trend factor. The trend factor, as detailed within the legislation, allowed for an annual increase of 3.5 percent in 2006, 3.25 percent in 2007, and 3 percent every year thereafter. The cap included both administrative costs that come with running the program as well as expenditures for client services. For New York City, the final cap amount in 2005-2006 was a little over $4.3 billion. An additional section of the cap legislation offered counties an alternative option to paying the cap amount. The alternative allowed counties to pay their share of Medicaid costs through a tax intercept by which the State would keep the sales tax collected from the county rather than remit the county share back to the county. Although this alternative option was created for counties with slow growing tax rates, only Monroe County took advantage of this option. Overall, the cap worked in terms of reigning in what counties spend on Medicaid. When the cap legislation was passed, it was projected that counties would save $6.4 billion over the following five fiscal years. In fiscal year 2009-10, the Medicaid cap limited county contributions to $6.7 billion; without the cap, counties would have spent $7.6 billion. Despite the cap fiscal burdens on counties still exist. Governor Andrew Cuomo, in the fiscal year 2012-13 executive budget, redefined both the local share as well as administration of Medicaid. Governor Cuomo proposed to eliminate the 3 percent annual increase paid by counties that had been included as part of the 2005 cap legislation. This proposal was enacted into law, resulting in additional relief for counties. Using 2012 Medicaid spending as a base, the annual increase for counties has begun to decrease: counties will pay a 2 percent annual increase in 2013 and a 1 percent increase in 2014 and in 2015. After 2015, Medicaid costs to counties will remain at 2014 levels. In addition to adjusting the local share, the Governor’s 2012-13 executive budget mandated the transfer of administrative responsibility from the counties to the state. Although overall state and local Medicaid administrative costs represent 2 percent of the total costs of Medicaid, administrative costs to counties in 2009-10 reached $1 billion. This was a 33 percent increase from 2005 when administrative costs were $764 million. Even with the 2005 cap and the gradual elimination of the 3 percent annual increase, administrative costs alone have become fiscally burdensome to counties. As a means of alleviating that administrative fiscal pressure on counties, the State Department of Health will assume the responsibility of administering Medicaid with State staff, contracted entities and contracts with counties. The transfer of administrative functions began in 2012; a complete takeover is expected to be completed by 2018. These changes represent the strides New York has made in mitigating the impact Medicaid spending has had on counties. However, it is too early to definitively say that these “solutions” will end county fiscal woes due to Medicaid spending. Across the nation, as well as in New York, health care is about to go through a transformation with the implementation of the Affordable Care Act; however, unlike the rest of the nation, New York is also navigating significant state-led changes in addition to the provisions noted above. Since 2011 New York has been reforming Medicaid through initiatives such as the Medicaid Global Spending Cap and moving Medicaid away from a fee-for-service model to a managed care model. The impact these changes will have, over time, will determine the level of Medicaid savings for counties. As of February 2013 Medicaid expenditures are 1.3 percent below projection whether this trend continues will determine the fiscal fate of counties. – Joseph N. Polito is the Legislative Director for Intergovernmental Affairs at the City’s Human Resources Administration. Polito is also an evening student at New York Law School where he is in his third year of studies. Disclaimer: The views expressed in this article are solely those of the author and should not be attributed to the Human Resources Administration of New York City or the City of New York. Kenneth E. Thorpe, Health Care, in The Two New Yorks: State-City Relations in the Changing Federal System 362-63 (Gerald Benjamin & Charles Brecher eds., 1988). Citizens Budget Comm’n, A Poor Way to Pay for Medicaid: Why New York Should Eliminate Local Funding for Medicaid (2011). Melinda Dutton et al., Medicaid Inst. at United Hosp. Fund, The Role of Local Government in Administering Medicaid in New York (2009). Deborah Bachrach & Mira S. Burghardt, Medicaid Inst. at United Hosp. Fund, Understanding the New State/County Paradigm: The 2005 New York State Medicaid Cap (2006). Alison Mitchell, Cong. Research Serv., Medicaid Financing and Expenditures (2012). The Kaiser Comm’n on Medicaid and the Uninsured, Medicaid: A Primer (2013). Paul Howard, The Medicaid Monster, City Journal, 2009. State of N.Y. Dep’t of Health, New York State Medicaid Administration November 2010 Report. For more articles like this one, we encourage you to subscribe to CityLaw, a 24-page bi-monthly journal, provides an overview of the City’s regulatory developments by reporting on administrative, legislative, and judicial decisions. The publication consists of a featured article, a legislative and regulatory update, case law highlights, and a profile.